Do you work with 4th graders? 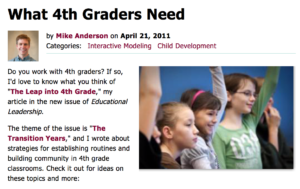 If so, I’d love to know what you think of “The Leap into 4th Grade,” my article in the new issue of Educational Leadership. I wrote the 3rd, 4th, and 5th grade Every Teacher books; my friend and colleague Margaret Berry Wilson wrote the books for kindergarten, 1st, and 2nd grades. The premise of the series is that each age and grade we teach is a bit different. When we know some general characteristics of children at the ages we teach, we can use those as starting points for setting up effective learning environments for our students. I’d love to hear your questions and comments! 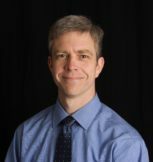 Mike Anderson is an education consultant who leads great learning throughout the United States and beyond. He is an award winning teacher and the author of many books. You can follow him on Twitter at @balancedteacher.